Jeannie has joined forces with fellow singer songwriter Gabriel Mann - who is a member of the Los Angeles-based alternative rock band The Rescues and was a backing singer for Adele at the 2013 Academy Awards - on their latest catchy jingle titled 'Tell Me What's Cooking', which will feature on the forthcoming animated movie that is set for release on DVD and digital download on October 24. The trailer for the movie has been released and has attracted a number of views on the social media channel YouTube. 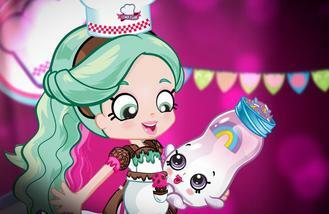 Shopkins first launched in 2014 and saw over 140 Shopkins characters and dolls released under the popular children's franchise to accompany its popular webisode. And the brand has continued to expand, which will see them take over the entertainment space with its debut film. The forthcoming production will see the Shopkin's favourites Kooky Cookie, Apple Blossom, Lippy Lips and Cheeky Chocolate meet newcomer PeppaMint who hopes to befriend Bubbleisha, Jessicake and Donatina. The new Shopkins film will be available to buy in high street stores and online, and the launch of the new DVD will also see the release of Shopkins season six, as well as Shopkins doll range, including an exclusive Kooky Cookie toy as well as the newcomers, who star in the film.